Much has been written about the lawn in American society, from books such as American Green: The Obsessive Quest for the Perfect Lawn and The Lawn: A History of an American Obsession to dissertations and theses such as Suburban Dynamics of Lawn Care. From my observations, the perfect lawn does not appear to be a priority of most Berkeley homeowners. Except for a section of homes surrounding the Claremont Hotel, I have seen few cases of perfectly manicured lawns with sprinkler systems. There are a number of likely reasons for this pattern. For one, many Berkeley homes have either tiny front yards or no yard at all. Due to the high number of bungalows in Berkeley, gardens influenced by the Arts and Crafts period are also popular. A small number of people have chosen to use their front yard to grow food. There are edible landscapes that contain a mixture of fruits, vegetables, and herbs mixed with traditional landscape plants. There are permaculture gardens and traditional raised beds. And then there are a few that have moved beyond the front yard to the parking strip area between the sidewalk and the street. 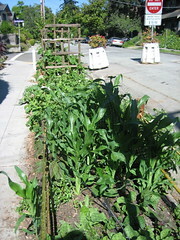 I spotted the vegetable garden pictured here on a quiet street near the Berkeley-Oakland border. While I spent some time at this garden admiring the range of vegetables and the natural fencing around the plot, several people walked by but no one seemed to notice all of the vegetables growing right out in public view. A common piece of advice given to reluctant walkers is that it would be good for us all to walk to take a break from our modern, fast-paced lifestyles. This may be good advice, but I am not about make such a subjective statement about how people should live their lives. What I will say is that when I walk I notice that the world is not moving as quickly as I once thought. This photo, for instance, was taken yesterday at the playground at Cedar-Rose Park. 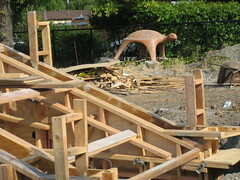 The playground, like many others around the country, is being reconstructed with wood that does not contain toxic preservatives. The turtle was yanked out of the ground last fall, and has been sitting in this spot for months. Construction stopped on the playground during our unusually rainy winter, and finally started again a few weeks ago. I have walked by this playground many times over the past few months but only last night made the connection between the turtle and the scene in which it resides. One could approach walking every street in a city in any number of ways, from freeform to methodical. My methodology lies somewhere in the middle. I generally map out a route beforehand and adjust as necessary along the way. Usually my routes will take me back to the same part of town a few times before I finish that section of the map, and I will walk some streets a number of times (especially because most of my walks begin directly from my home). On Sunday morning I was looking over my map to plan out a route for the day and noticed a grid of east-west streets in South Berkeley that I had not walked. Unlike my previous walks, I decided to walk all of the streets, one by one, winding my way through the section from San Pablo Avenue to Acton St. and back again. I found that with this process, I really got a feel for this neighborhood surrounding San Pablo Park. Berkeley values its architectural heritage. Stories about disputes involving the destruction of historic houses regularly appear in the local press. I have heard plenty of comments from building contractors and homeowners about particularly time-consuming building permit process in Berkeley. But walking around this neighborhood, it was hard to believe any of this. "Anything goes" seemed to apply to this area, from strange little boxes added on to the top of a house to formerly tiny bungalows now engulfed by huge add-ons to houses resulting from tear-downs that one might expect to see in a new housing development. And then there is the fish house. Here's an aerial view of the house, which was designed by local architect Eugene Tsui for his parents. 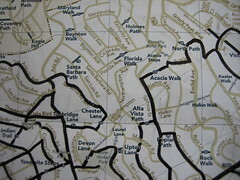 There are several maps of Berkeley, but the one published by the Berkeley Path Wanderers Association is ideal for recording the progress of a complete walk of Berkeley's streets. In addition to clearly marked streets, the map shows all of the pathways and stairways that can be found throughout the city. This blog will document some of the interesting things I encounter in my attempt to walk every street in Berkeley, California, my current place of residence. Why am I doing this? First and foremost, I find walking to be an enjoyable activity. About five years ago I sold my car because I did not want to support all of the bad things that come along with having a car (support of the oil industry, pollution, etc. ), but even before that time I had always walked a lot. I have explored on foot most places I have lived and visited. Prior to moving to Berkeley I lived on the Peninsula, which was more spread out, and I got around on bicycle more often that on foot. Upon arriving in Berkeley, I found that most places I wanted to go were within walking distance. So why walk every street in Berkeley? At least a couple of times I have heard the suggestion of getting to know your community by walking the streets in your neighborhood. Then I read an article in the New Yorker about a man who walked every street in Manhattan. Nothing could be as interesting as walking every street in Manhattan, but I figured there might be a few things to see walking the streets of Berkeley. It is a pretty ideal size to walk; not too small, but big enough to be a challenge. Does the world really need another blog? Although I started walking last year, I dismissed the idea of recording my experiences online. After several months of walking, though, I realized that others who live in Berkeley might enjoy learning more about the city where they live. I also hope that this blog will encourage others to get out on foot and explore the place where they live.